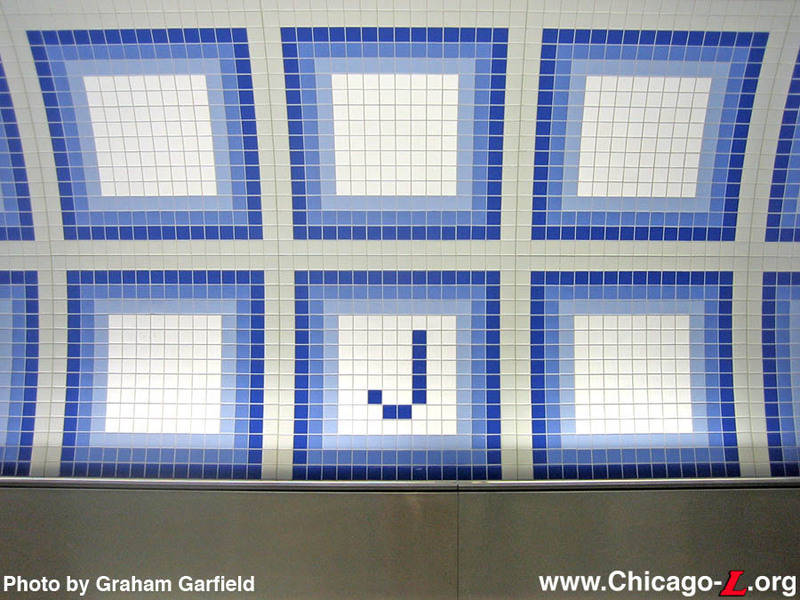 Jackson/Dearborn is typical of the downtown Dearborn and State Street subway stations, consisting of two mezzanine entrances feeding each end of the stop, which is a designated portion of a long "continuous" platform that stretches the length of the Loop. The Dearborn Subway's continuous platform, a bit shorter than its record-setting State Street cousin, is 2,500 feet long. 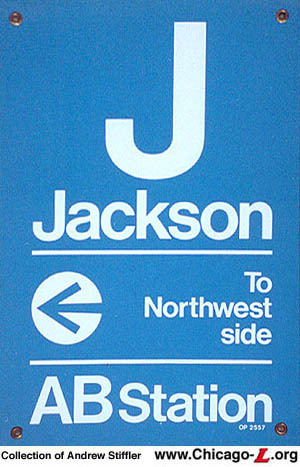 Jackson, as a transfer station, also had two passageways to the State Street Subway one block east. One was at the mezzanine level between the Adams-Jackson mezzanines of each subway, while the other was in the paid area and ran between the platforms below Jackson Boulevard. The architecture of the station was streamlined Art Moderne with some Art Deco elements, simple and austere compared to earlier subways in New York, London, Paris or other systems but very much in the style and fashion of the period in which it was designed. At street-level, the entrances were very simple, consisting of stairs down from the sidewalk surrounded by simple tubular railings with a smooth identification pylon at the back with Deco rings around the top. 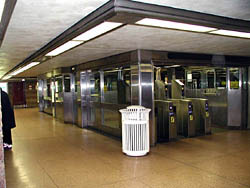 The fare controls were at a lower mezzanine level beneath Dearborn Street. The station mezzanines had broadly curving walls, which served to both reinforce the Moderne, streamlined architectural style employed in the Initial System of Subways station as well as to direct passenger flow through subtle design cues. The interior had smooth concrete floors and ceilings, red for the former and a neutral color for the latter. 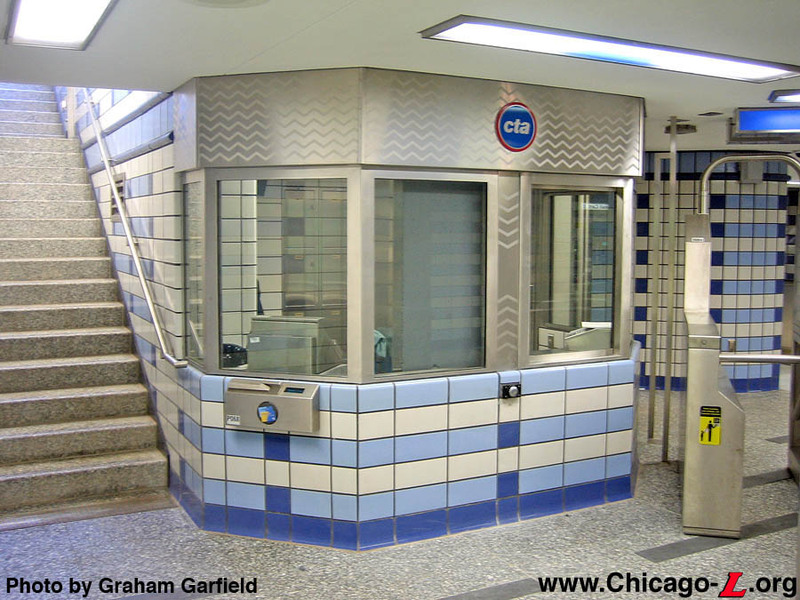 The fare control booths had an angled Deco design and were made of stone walls with a small ventilation grate near the bottom and glass windows on all four sides, allowing for maximum visibility of the mezzanine for the station agents. 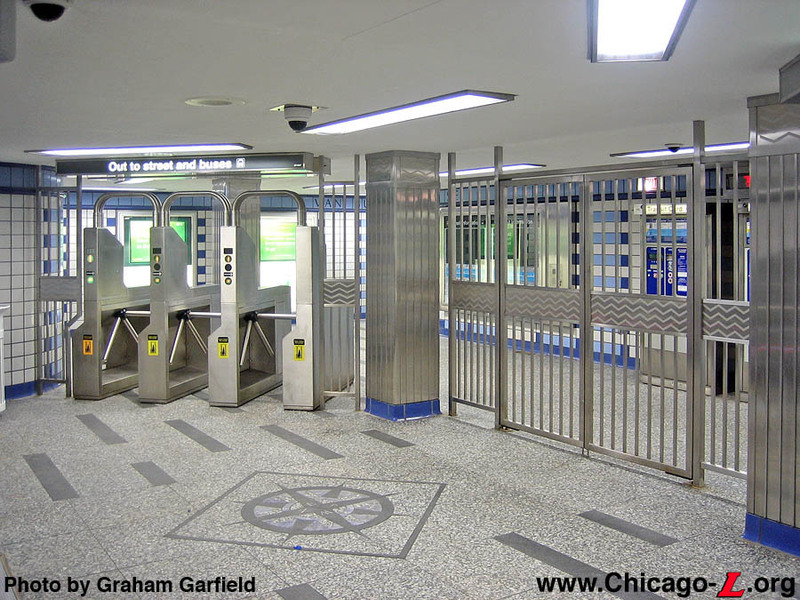 Turnstiles were steel, with some angled toward the entrances and a number of self-serve coin-operated models for efficient traffic circulation. Each mezzanine also had several amenities for the use of passengers, such as public phones, lockers, restrooms, and concessions. 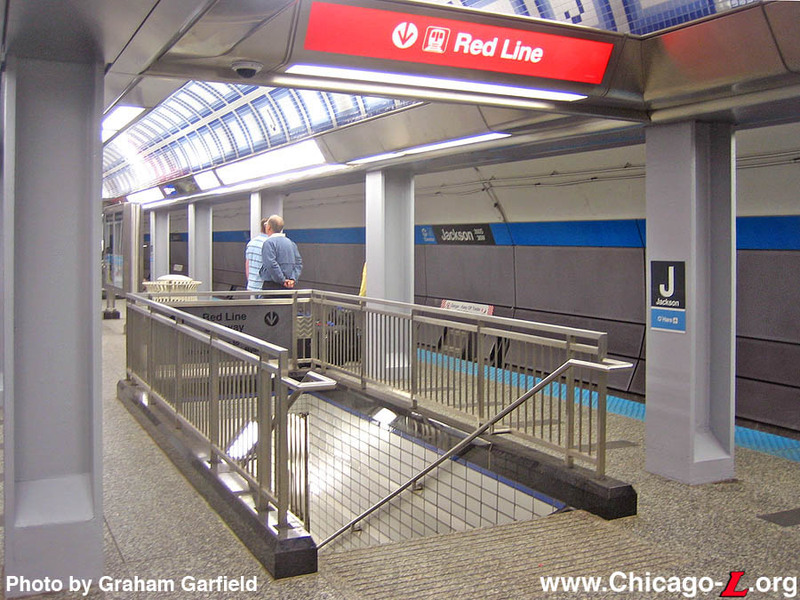 The mezzanines at Adams-Jackson and at Jackson-Van Buren are largely the same except for two differences. First, the mezzanines had different wall finishes as originally built. 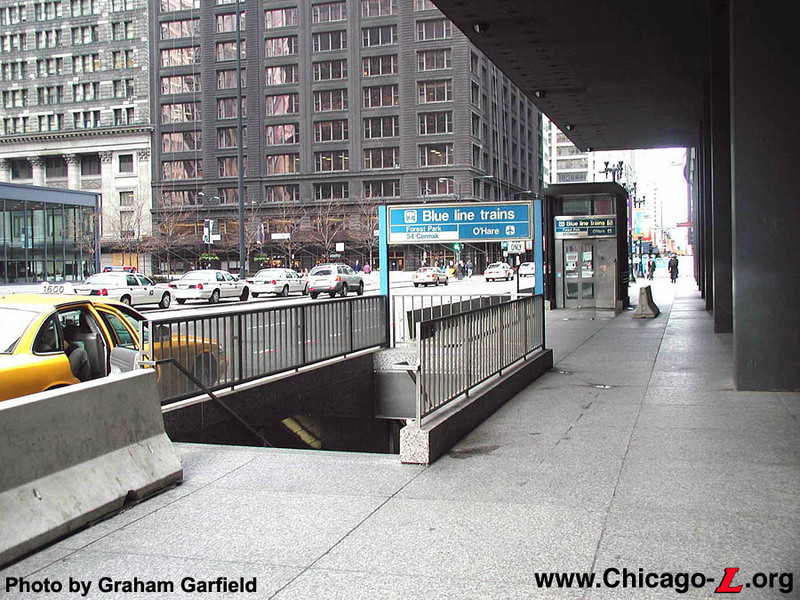 This is a result of the Adams-Jackson mezzanine opening concurrently with the State Street Subway, eight years before the Jackson-Van Buren mezzanine and the operation of the Dearborn Subway (see below for more on the gap between subway openings). 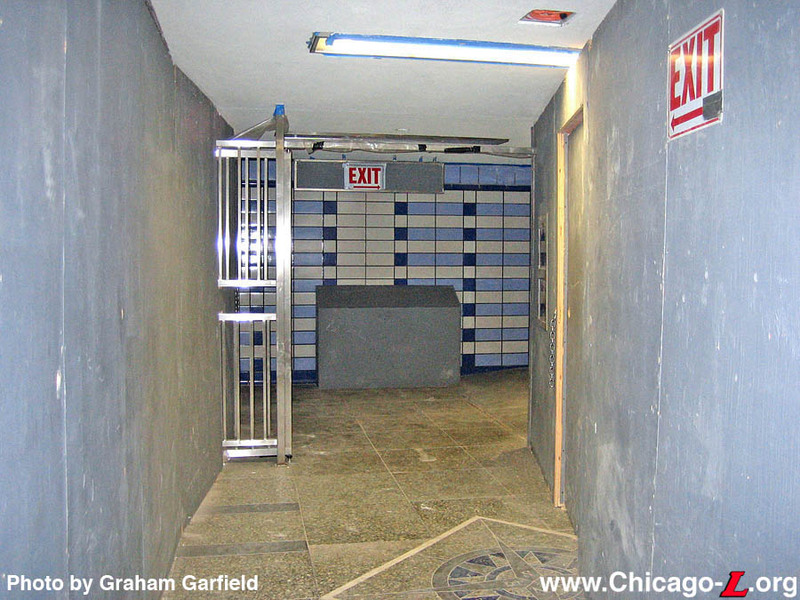 Although the subway line itself wasn't open, the upper-level transfer tunnel and Adams-Jackson mezzanine opened concurrently with the State Street Subway -- as did the passageway and mezzanine at Randolph-Washington -- to allow convenient passage from Dearborn Street to the State Street station via a below-grade walkway. Although it was not operationally necessary to do so (since it didn't need to function as a fare control facility or allow access to the platform), the wall surfaces of the Adams-Jackson mezzanine were finished when it opened, so it featured the structural glass wall cladding and black marble-faced structural columns that the State Street stations opened at the same time did. 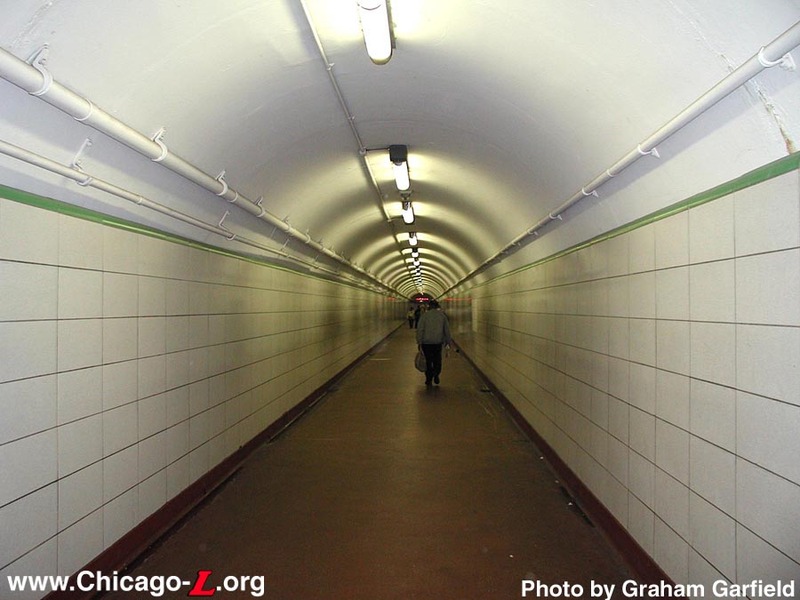 By the time the rest Dearborn Subway was finished and service inaugurated, the Department of Subways and Superhighways made some modest changes to the station finishes. 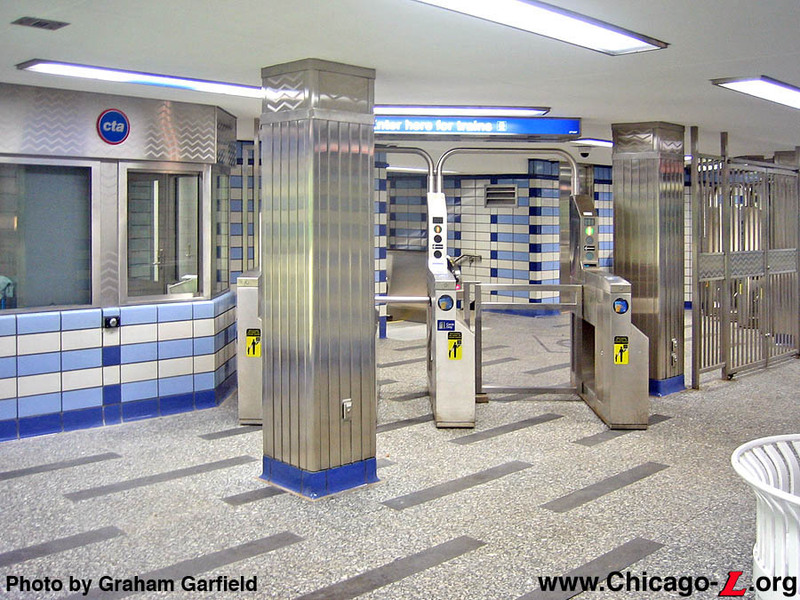 As such, the Jackson-Van Buren foresaked the easily-broken structural glass walls and marble-faced columns of the State Street Subway for off-white glazed ceramic tile. Secondly, the Adams-Jackson mezzanine was symmetrical across both axes, with two sets of stairs and escalators down from the mezzanine to the platform, one on the north half of the mezzanine and one on the south. The Jackson-Van Buren mezzanine, however, was the last entrance on the continuous platform and thus only fed the platform from one side, with a stair and escalator down from the north half of the mezzanine. The island platform had red no-slip concrete floors, curved, barrel-vaulted concrete ceilings and a row of I-beam steel columns along each platform edge. Unlike some of the more ornate subways in other cities, the walls along side the tracks in the stations were left as unfinished concrete rather than tiled. To aid in station identification, each station had a color scheme that was used in the accents like tile borders, platform column color, and signage lettering and background. The colors blue, red, green, and brown were rotated in sequence beginning up at Division & Milwaukee. Jackson's accent color was green. A specially-designed Futura typeface was used throughout the subway on metal, tile, and backlit glass signs. Fluorescent lights and illuminated station signs hanging from the ceilings finished the decoration. The low-level transfer tunnel, which was built in 1939-1943 as part of the original construction of the subways but not opened until the Dearborn tubes were put into service, was simple in design and execution, befitting the streamlined architecture of the Depression-era subways. The floor was smooth red concrete, the same as the station platform. 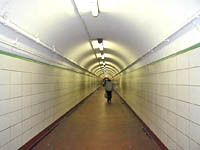 The ceiling of the majority of the tunnel was smooth arched concrete, while the walls were large, smooth glazed tiles with a light green trim along the top (consistent with Jackson being a "green" station in the subway's scheme of four rotating highlight colors). At each end, where the stairs to the subway platforms were, the ceiling dropped down and became flat due to presence of the trackbed above it. The wall tiles also changed from the large horizontally-rectangular tiles to small vertically-rectangular ones. There were two stairs to each island platform at each end of the transfer tunnel. 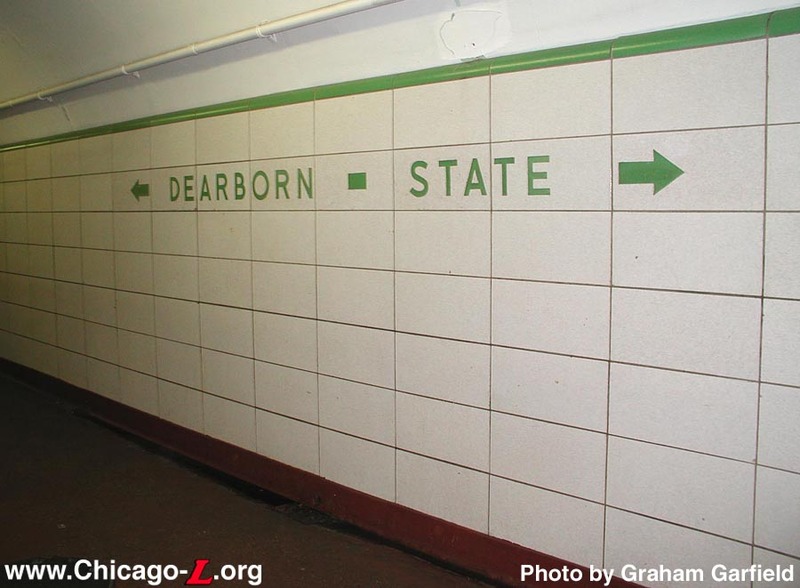 In the middle of the tunnel, both walls had lettering inlaid in the tile, in the Futura typeface used throughout the original subways, directing passengers which direction State and Dearborn streets were. Though much of the structural work of the Dearborn Subway was concurrent with that of State Street's (which was begun in 1938 and opened in 1943), construction on the Dearborn line was suspended in 1941 due to wartime materials shortages. Even after the war was over, it was another several years before work was resumed. Finally, the Milwaukee-Dearborn Subway was completed and opened on February 25, 1951, eight years after the State Street tubes were inaugurated. This is when Jackson station opened. Upon the opening of the Congress Line and the inauguration of West-Northwest Route through-service in 1958, the locations of Loop-Subway transfers downtown was changed. The old Dearborn/Van Buren station, later an auxiliary entrance to State/Van Buren, was right above the Jackson-Van Buren subway entrance, so on June 22, 1958 a "down" transfer from the Loop Elevated at State was instituted to that Jackson mezzanine. Passengers could not transfer "up" from the subway to the Loop here, however. This transfer remained between Lake Transfer and Clark/Lake at the north end of downtown (or, if they really wanted to transfer in the South Loop, they could transfer via the lower tunnel to Jackson/State, where both "up" and "down" transfers to State/Van Buren were allowed). This transfer policy remained in force until September 28, 1969, when the Dan Ryan Line and the West-South Route service began. At this time, transfers in both directions returned to Lake Transfer and Clark/Lake, where they remain today. In the early 1960s construction began on the Chicago Federal Center, a collection of government buildings above the Adams-Jackson mezzanine. The high-level transfer passageway between the State and Dearborn subways temporarily closed on September 9, 1961 due to the construction of the Dirksen Federal Building, reopening on October 15, 1961. The 30-story Dirksen courthouse building, designed by noted architect Ludwig Mies van der Rohe, was completed in 1964. Eleven years later, the 42-story Kluczynski Federal Building was built across Dearborn Street. Completed in 1973, this project created a large plaza on the corner of Adams and Dearborn (containing Alexander Calder's famous red Flamingo stabile) resulting in the mezzanine entrances from the west side of the street being reconfigured. The northwest stairs to Adams-Jackson were closed, while the southwest stairs were widened and modernized with new flooring, new wall cladding, and a new street-level entrance. The mezzanine remained unmodified, however, with the exception of the sealed stairway. 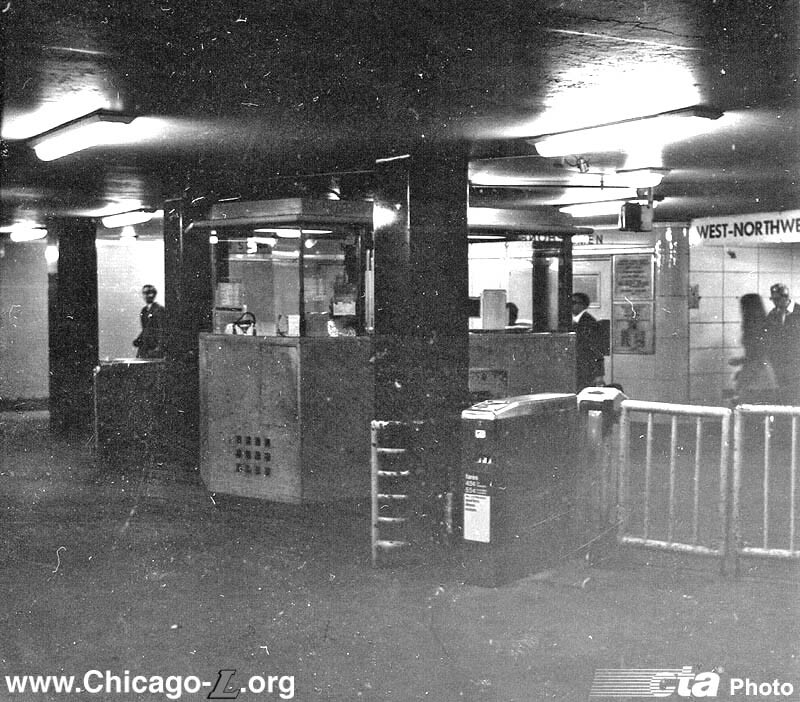 Amid a series of station closures and service reductions in the 1970s, the Jackson-Van Buren mezzanine entrance to the station was reclassified as a part-time entrance, closed from 2200 to 0600 hours Monday-Saturday and all day Sundays effective September 12, 1976. This situation continued for nearly 25 years, with the exception of a two-year period when the other mezzanine was being renovated (see below). This operating plan was reversed at a press conference on Monday, June 5, 2000, when CTA President Frank Kruesi announced that beginning Saturday, June 10th and Sunday, June 11th, six downtown area "L" and subway stations and seven station entrances that were closed late at night or on weekends would be open at all hours that trains are in service. One of the seven secondary part-time entrances to be reopened was Jackson-Van Buren. Starting at 0600 hours Saturday, June 10th, Jackson-Van Buren entrance returned to 24-hour operation. 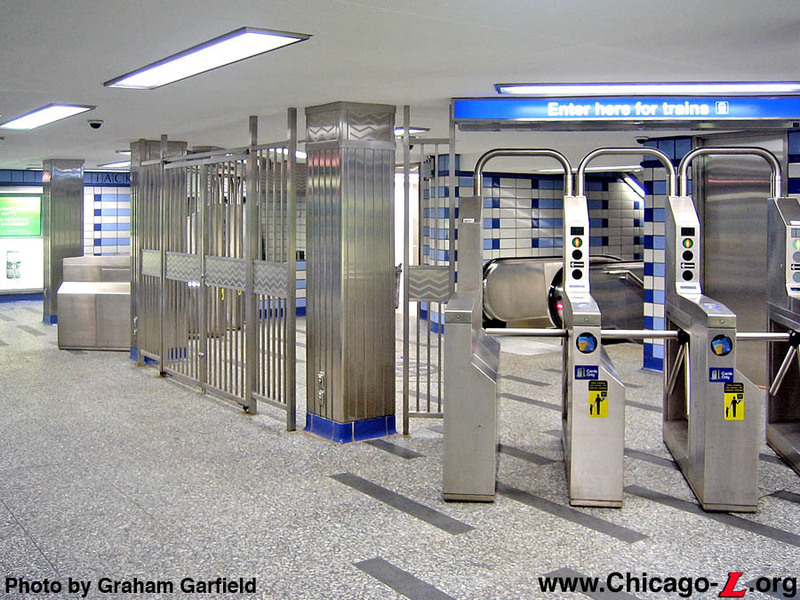 Opening these stations and entrances is just one of the components of a $539,000 service improvement package that was passed by the Chicago Transit Board in May 2000. Plans have long been afoot to renovate Jackson station, though they were implemented in piecemeal fashion. On Friday, May 7, 1982, Mayor Jane Byrne announced the Subway Renovation Program. 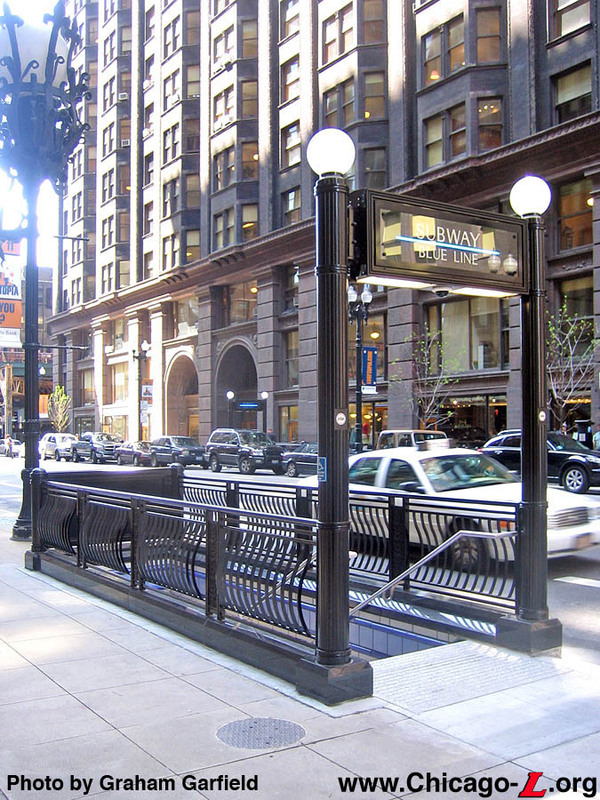 Encompassing both the State and Dearborn subways, the renovation program included the continuous platforms on State between Lake and Congress and on Dearborn between Randolph and Van Buren; the 14 mezzanines along these platforms; and the four pedestrian passageways connecting the State and Dearborn subways here and at Washington at both the mezzanines and platforms. In addition, mezzanines and platforms would have been renovated at Chicago, Grand, Harrison, and Roosevelt on State and the Lake Transfer and LaSalle/Congress stations on Dearborn. At all mezzanines, the existing facilities were to be stripped back to their basic structural shell and completely renovated with gray granite panels with stainless steel accents. New fare collection facilities, lighting, flooring, and column coverings were also to be installed. A uniform system of signage and maps would be provided and facilities for the enhancement of passenger security would be incorporated. Amenities such as telephones and concession areas would also have been provided as appropriate. At the platform level, new lighting, flooring, wall, ceiling, and column treatments would have been provided. Stairways and escalators from the platforms to the mezzanines would be replaced or renovated in kind. Signage, maps, benches, and concession facilities will be compatible with those developed for the mezzanine. Renovation was undertaken in 1982-83 at the two Washington subway stations, but work at the other stations proceeded at a delayed rate or, in some cases, not at all. Renovation and remodeling of Adams-Jackson did not begin until 1989. 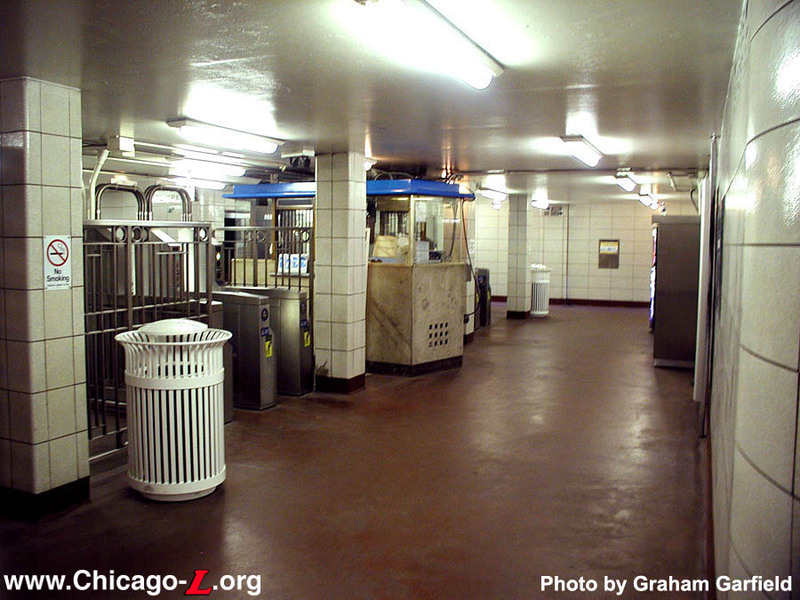 This mezzanine, as well as the Adams-Jackson mezzanine on the State Street Subway, closed on on March 11, 1989 to allow the $6.9 million renovation project to began. At the same time, the Jackson-Van Buren mezzanine temporarily returned to 24 hour service for the duration of the renovation work. Although completed nearly 10 years after the announcement of Byrne's program, the renovation followed the same general architectural plan first generated a decade before, with gradual work on the design completed during the seven years between announcement and commencement. The renovated Adams-Jackson mezzanine is markedly different from its former self in both style and layout. Gone was the mezzanine's Art Moderne style, trading it for '80s-style modern finishes. Also gone was the mezzanine's bi-axial symmetry (technically lost in '64 when the northwest stair closed), with the new fare controls only on the south half of the station and the north stair to the platform becoming exit-only with a mezzanine-level rotogate. (The refurbished mezzanine is still largely symmetrical across the north-south axis.) The renovated mezzanine has terrazzo floors and granite-clad walls, with stainless steel accents, soffits, agent's booths, and fare controls. Abandoning the angled booth and fare controls of the old mezzanine, the new arrangement is strictly rectilinear. There are two two-position agent's booths, one on the west side of the mezzanine and one centered on the north end. 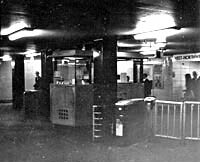 Besides the agent-controlled Visifare turnstiles on those sides, the east side had coin-operated turnstiles facing the transfer tunnel. The unpaid area was reduced to a corridor that followed the west, north, and east walls of the mezzanine. Concession spaces were featured on both sides of the unpaid area behind the stairs to the street. The southeast stair was modernized similarly to the southwest one, but not widened, while the northeast stair was removed (reducing the street-to-mezzanine access from the as-built four stairs down to two) in favor of an elevator. Meanwhile, the paid area of the mezzanine was expanded southward behind the stairs and escalator to accommodate the elevator to the platform, completing the station's accessibility. 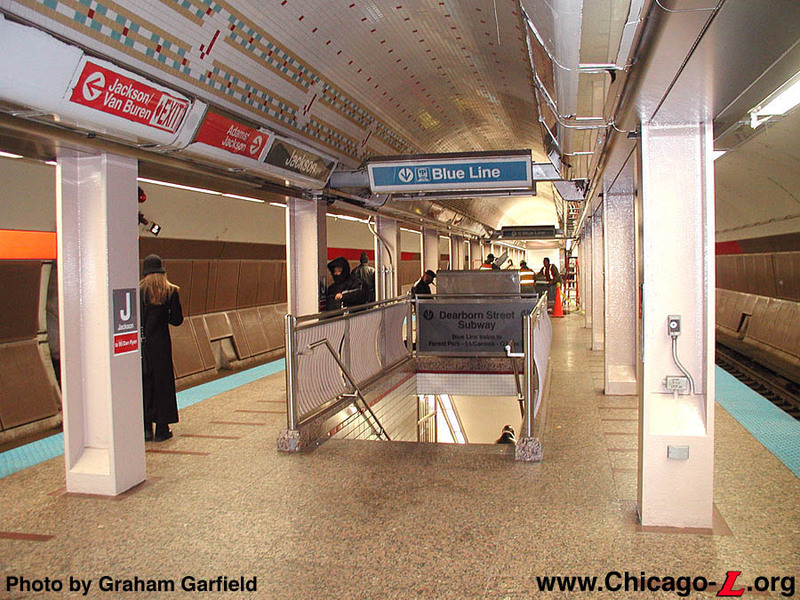 Neither the platform (except for the elevator and new wall cladding around the stairs to Adams-Jackson) nor the Jackson-Van Buren mezzanine were modified in this renovation. 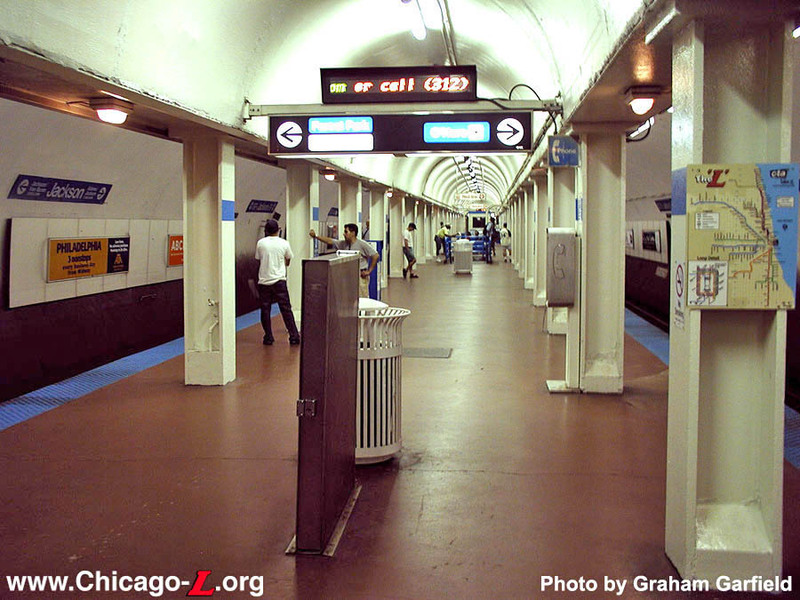 The Adams-Jackson mezzanines on both the State and Dearborn subways reopened on May 13, 1991. On the same date, the Jackson-Van Buren mezzanine returned to part-time hours until 2000. 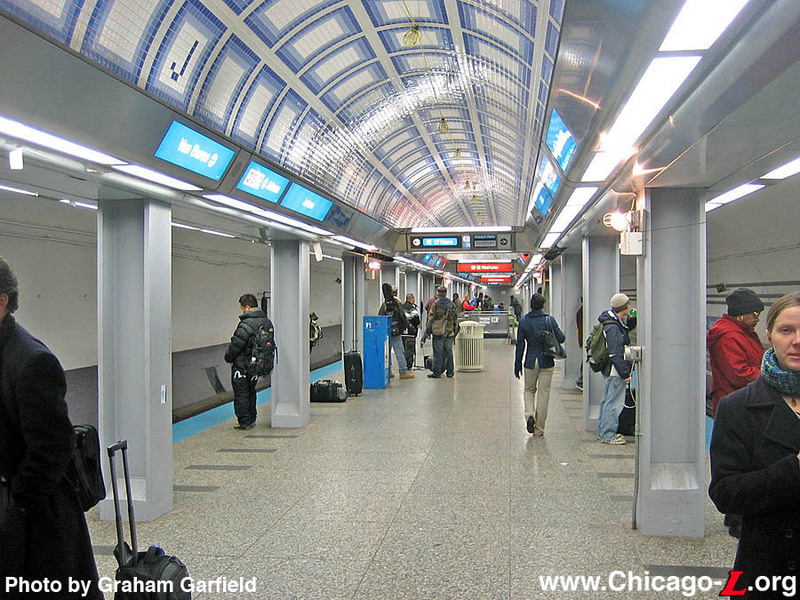 The other stations scheduled to be renovated under this program, in this very modern style, were never undertaken, although five years later Chicago Department of Transportation (CDOT) would begin another subway renovation program. None of the platform-level remodeling was ever completed under the Byrne or Washington administrations' program. The City did not revisit the idea of completing the Jackson renovation for nearly a decade until, in the late 1990s, it was again in CDOT's capital program. 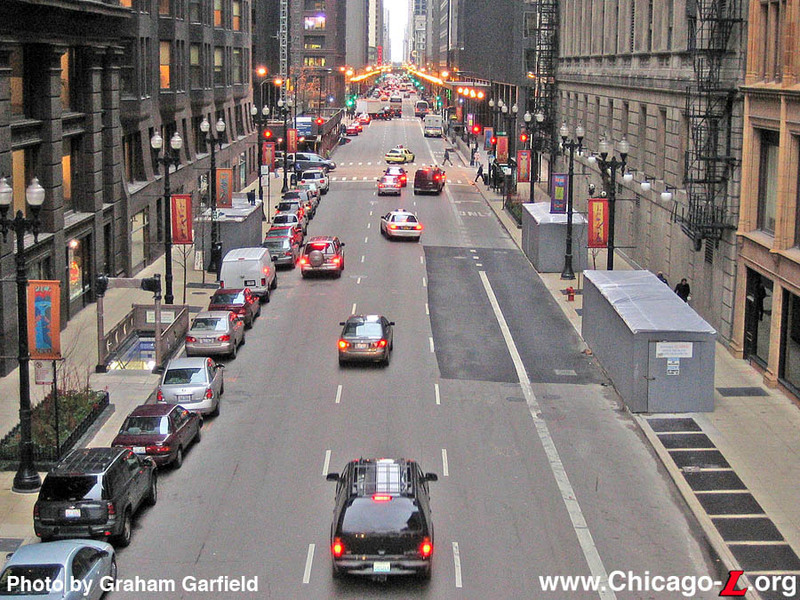 The Chicago Department of Transportation's 2002-05 Capital Improvement Program had the engineering and design for the renovation of Jackson/Dearborn. Although CDOT no longer uses the steely 1980's idea of modernity in its subway designs, the project leaves Adams-Jackson as it is but follows a different design aesthetic for the renovated platform and Jackson-Van Buren mezzanine. 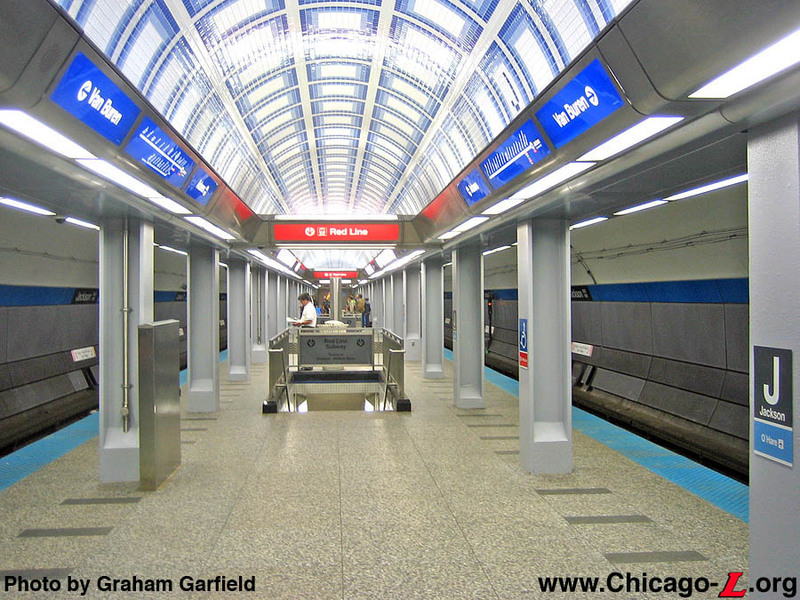 Muller & Muller Architects was responsible for architectural design services for the renovation of the Jackson-Van Buren mezzanine and Jackson portion of the continuous island platform. The firm was tasked with reviewing the station entrances, mezzanines and platforms and with making recommendations on a unified architectural treatment for the downtown stations along the Blue Line. Work at Jackson-Van Buren and the Jackson platform included new tile wall and granite floor surfaces, tile ceiling finishes and new stainless steel light trays on the platform, new acoustical panels on the tunnel walls, new escalators (including one from the street to the mezzanine, a Dearborn Subway first, not counting those in the Thompson Center and 203 N. LaSalle buildings at Clark/Lake) and stairway finishes, new concession areas, a new Customer Assistant kiosk, additional turnstiles, new street-level entrance kiosks, new signage, new, brighter, energy-efficient lighting, new security cameras and monitoring equipment, revisions to platform ETS systems, and maintenance needs. 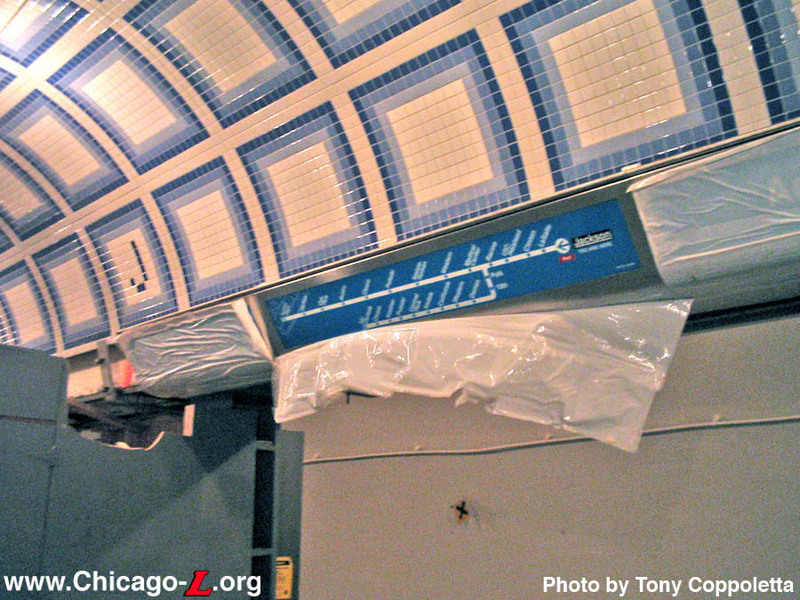 Test designs for a new tile pattern for the arched ceiling over the continuous platform were tested north of the Adams-Jackson mezzanine, on the unused section of the continuous platform between the Jackson and Monroe stops, with paper mockups in Autumn 2001. The paper patterns were left on the ceiling long after evaluation was complete and were not removed until 2005. 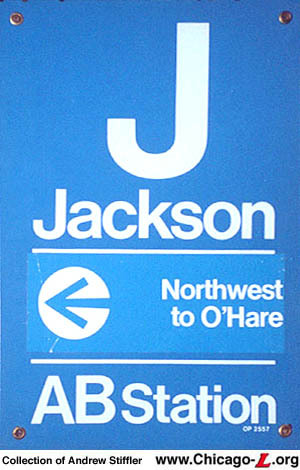 The construction phase of the renovation program for Jackson-Van Buren and the Jackson platform began on Friday, November 4, 2005. At 9pm that day, the Jackson-Van Buren mezzanine closed temporarily for the weekend while much of the mezzanine was partitioned off to allow construction to begin. The mezzanine reopened on Monday, November 7, 2005 at 5am as an exit-only facility. Similar to an arrangement that was used at Lake station during its renovation in 2004-05, closing off most of the mezzanine from public access allowed the construction contractor nearly unrestricted access to work quickly and efficiently while still at least allowing customers to use the mezzanine as an exit if not an entrance. The northwest, southwest and southeast stairs were temporarily closed. The northeast stairs remained open for egress with a rotogate controlling access in the mezzanine. The Adams-Jackson mezzanine remained open, 24-hours a day, during the project. Once the Jackson-Van Buren mezzanine was largely closed to passengers traffic (except for the exit passage), general contractor FHP Tectonics and their subcontractors set to work demolishing the mezzanine and removing the existing concrete flooring on the platform for replacement. The south stairs from the platform to the lower-level transfer tunnel to the State Street Subway were closed for renovation; the north stairs remained open. 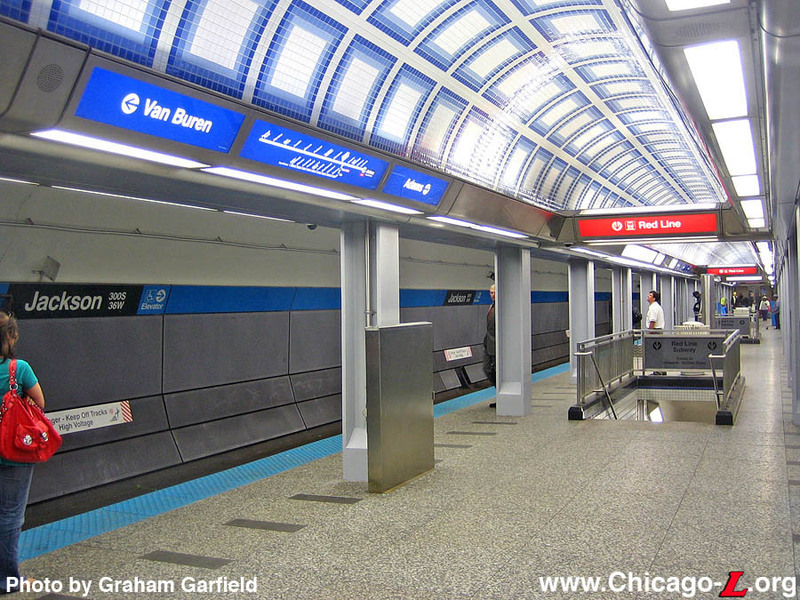 During late 2005 and early 2006, the contractors stripped the Jackson-Van Buren mezzanine back to its structural shell and began installing few electrical, mechanical, and communications infrastructure. 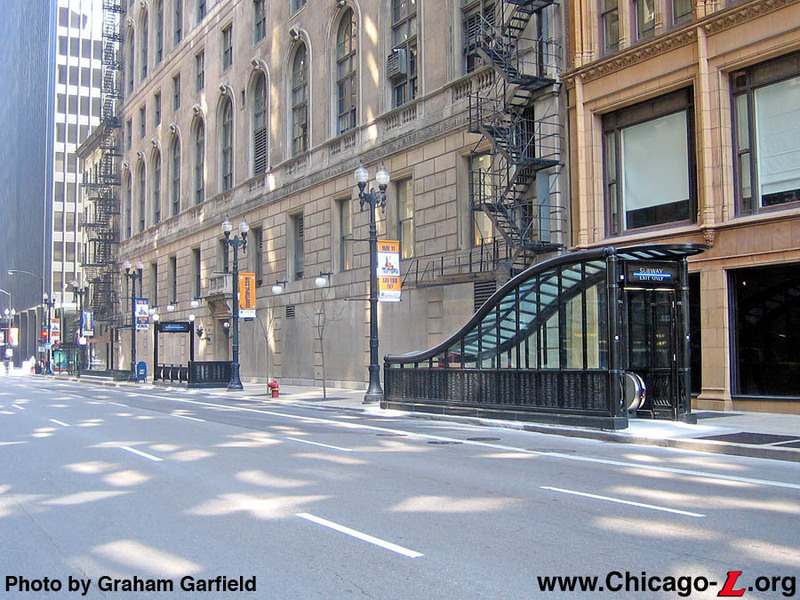 In March 2006, the egress from the Jackson-Van Buren mezzanine to the street was moved from the northeast stair to the street to the southwest stair. By the end of March 2006, metal liner panels were installed along most of the center vault over the platform. Work had also been initiated on installing new granite flooring and stripping the existing I-beam columns of decades of paint. By mid-May 2006, the renovation of the south stairs to lower-level transfer tunnel was completed and the stairs were reopened, and the north stairs were closed for improvement. 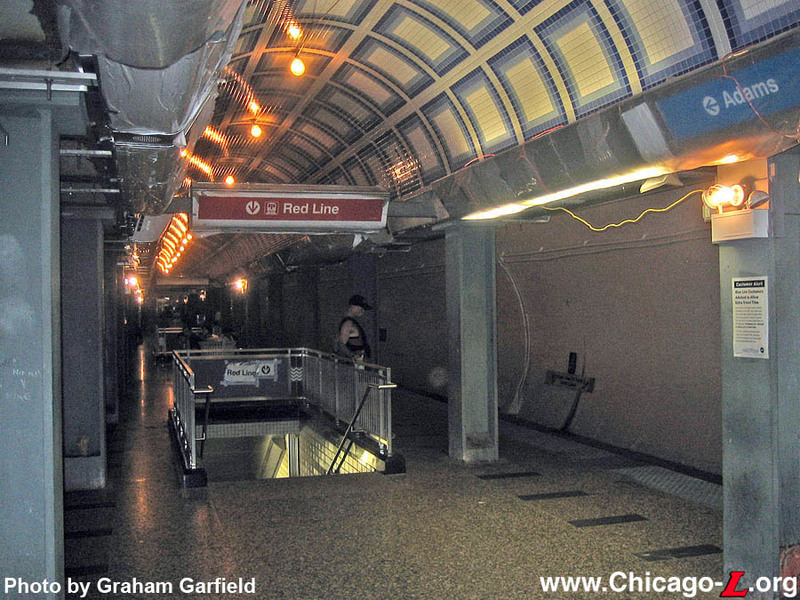 The new granite platform flooring was installed from the south transfer tunnel stairs to the stairs to the Jackson-Van Buren mezzanine and installation of the new ceiling tile panels in the central vault had begun at the south end of the platform. Granite for the floors was brought to the station for the flooring subcontractor, W. R. Weis Company, by a series of chartered work trains. Work continued apace into Summer 2006, when work in the Jackson-Van Buren mezzanine concentrated on installing new electrical, communications, and HVAC systems, as well as the beginning to install the new wall and floor cladding. 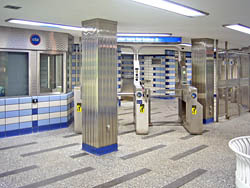 The walls are tiled in a pattern of blue, gray, and white hues, while the red concrete floor is being replaced with light gray granite tiles. The columns and other accents were sheathed on stainless steel, decorated with a Deco-style zig-zag pattern etched in the steel. Work required the mezzanine to be closed over the weekend of August 4-6, 2006, and upon reopening at 5am on Monday, August 7 the northwest mezzanine-to-street stair -- where egress to the street had since been moved to -- was closed. Exiting was again from the northeast stair. Progress also continued on the Jackson platform. By September 2006, the new platform flooring had been completed, consisting of light gray granite with dark gray granite panels under the colonnade along the platform edges. The west end of the lower-level transfer tunnel was completed, as were both stairs from the tunnel to the platform and the associated railings and grillework. Installation of the new tile panels down the center vault of the platform were also completed during Summer 2006 and most of the new stainless steel light trays along the colonnade soffit were also installed. The light trays, installed by subcontractor MG Electric, consist not only of down-lights and up-lights that put illumination on the platform and ceiling vaults, respectively, but also backlit signs that direct passengers to the mezzanine exits, provide the station name, transfer information and directional line maps, and include integrated LED signs. 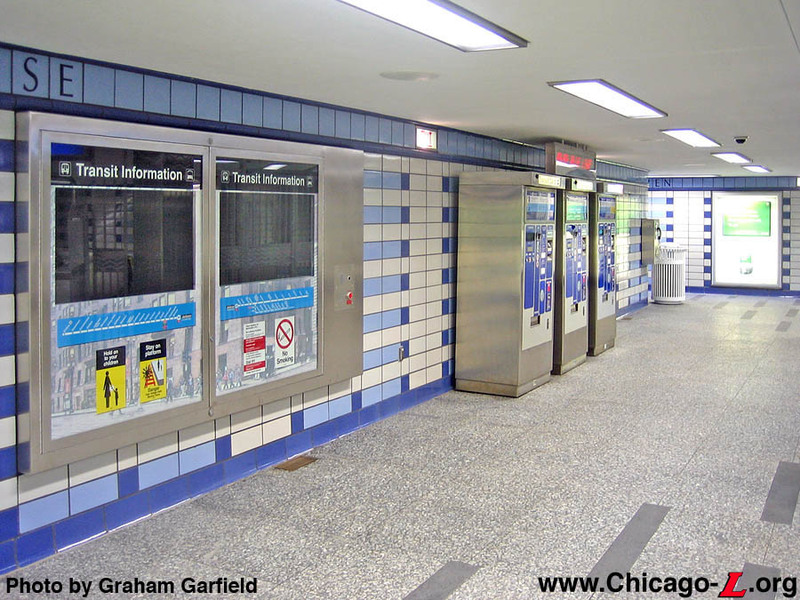 By the end of November 2006, the wall tiling in the Jackson-Van Buren mezzanine appeared to be largely complete, with some fittings such as backlit advertising panels already installed. Some work was still taking place behind the plywood walls that channel passengers from the platform stairs to the street. During autumn, the new escalator from platform to mezzanine level was installed, with the subcontractor, KONE, delivering the new escalator to the platform using a chartered work train from. 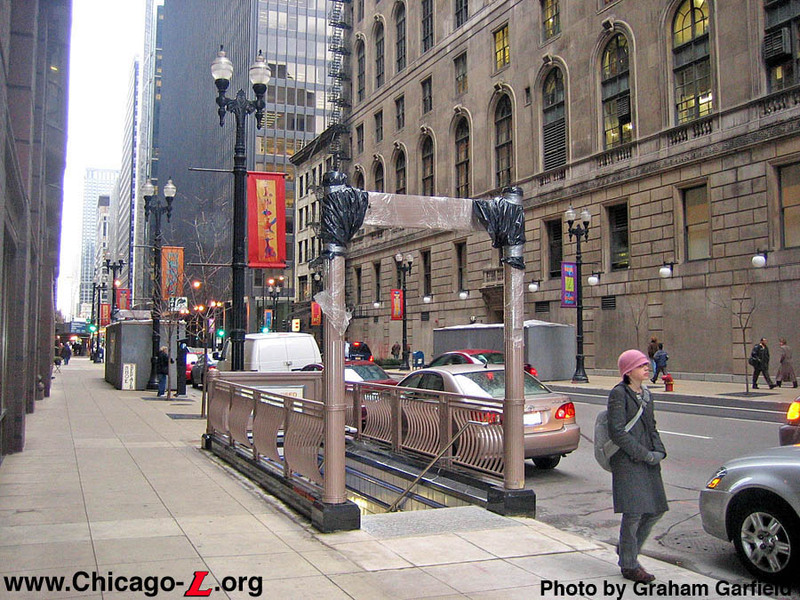 At street level, the first two new entrance kiosks were installed by the end of November 2006, both on the west side of Dearborn Street next to the historic Monadnock Building. 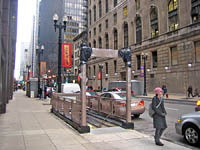 The stair enclosures are copies of the one installed on the northwest corner at Chicago/State in 2001, with two globe-topped posts in front with an entrance sign between them, a decorative railing around the sides and back, and a small peaked roof over the stairs at the rear of the stair opening. The southwest entrance was in use (as an exit), while the northwest stairs were still enclosed by a plywood enclosure. When originally installed, the stair kiosks were gold-colored. 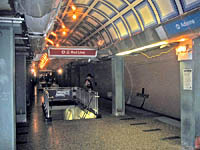 At platform level, all of the new gray granite flooring, ceiling tiling, and light trays with associated backlit signage was in place by the end of 2006 and the I-beam columns down the platform were painted light gray. The tunnel walls had been painted white, except for the bottom few feet, which were painted dark gray (probably to obscure the omnipresent brake dust that settles on the bottom of the tunnel walls). On the southbound side, the brackets had been installed on the tunnel wall for the new acoustical paneling. 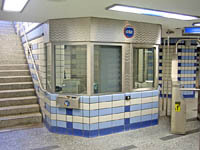 In mid-January 2007, the third entrance kiosk, identical to the other two previously installed on the west side of Dearborn Street, was installed on the east side of Dearborn for the northeast stair from the mezzanine. The kiosk was surrounded by a plywood enclosure, as the stairway was still closed to traffic. By mid-February 2007, all of the acoustical panels were installed on the tunnel walls opposite the platform, except for the top row where the station name signs and a colored band (blue, in this case) would be affixed. A bench, identical in design to those used at the renovated Jackson and Lake Red Line stations, was also installed at the south end of the platform, sporting curved wood slat seats and stainless steel circles that double as legs underneath, mounted on granite bases, and as a curved bar projecting through the slats at each end of the bench. At the end of February 2007, the entrance kiosk for the new mezzanine-to-street escalator, in the location formerly occupied by the southeast stairway, was installed. 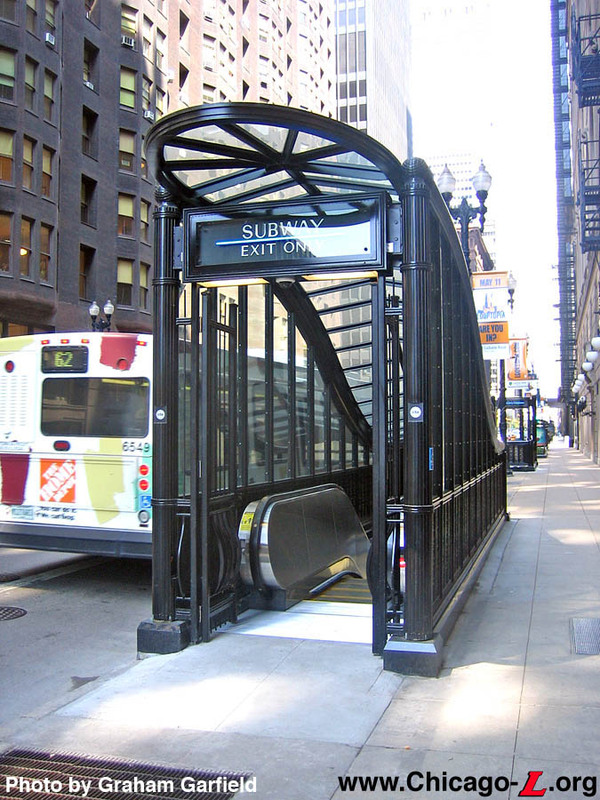 The kiosk is similar to those used by CDOT at Chicago/State in 2001, except it is narrower (those at Chicago house a stair and an escalator; this one only houses an escalator) and it is black rather than gold. The kiosk was enclosed in plywood as it was not in use, although the top of the tall kiosk poked up out of its plywood container. During late April 2007, a flurry of activity was performed to ready the Jackson-Van Buren mezzanine for reopening. During this period, the top row of acoustical panels on the tunnel wall opposite the platform were installed, featuring station name signs and a reflective blue band. At 9pm, Wednesday, April 25, the mezzanine closed completely to allow the final preparatory work to be performed. During this final week, additional fixtures were installed, including the flat panel information screens in the south mezzanine wall and in the freestanding Transit Information kiosk on the platform between the stairs to the lower transfer tunnel. Additional signage was installed, as were more backlit graphics in the platform light tray, although the installation of both would continue into May. 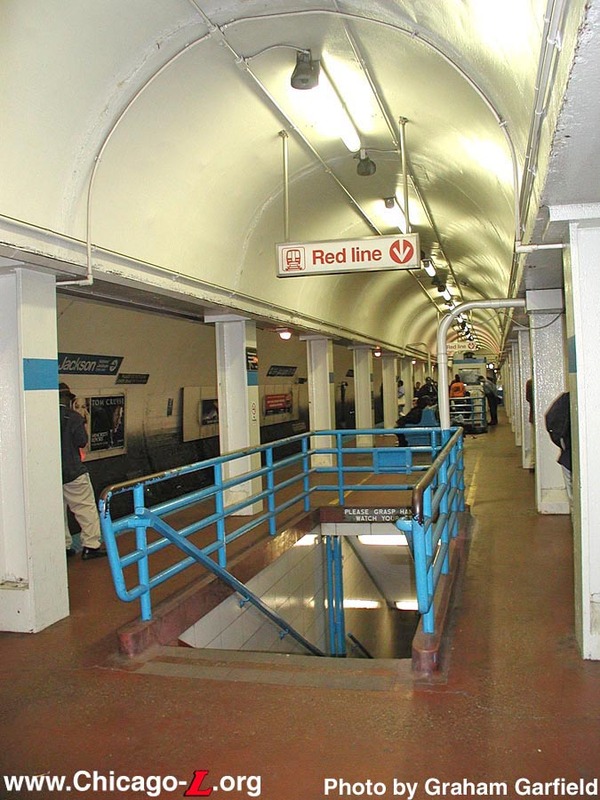 Beginning Friday, April 27 and into the weekend, the mezzanine and platform were thoroughly cleaned and polished and the stair entrance kiosks on Dearborn Street were painted black. Over the weekend, the turnstiles and farecard vending machines were installed in the mezzanine. 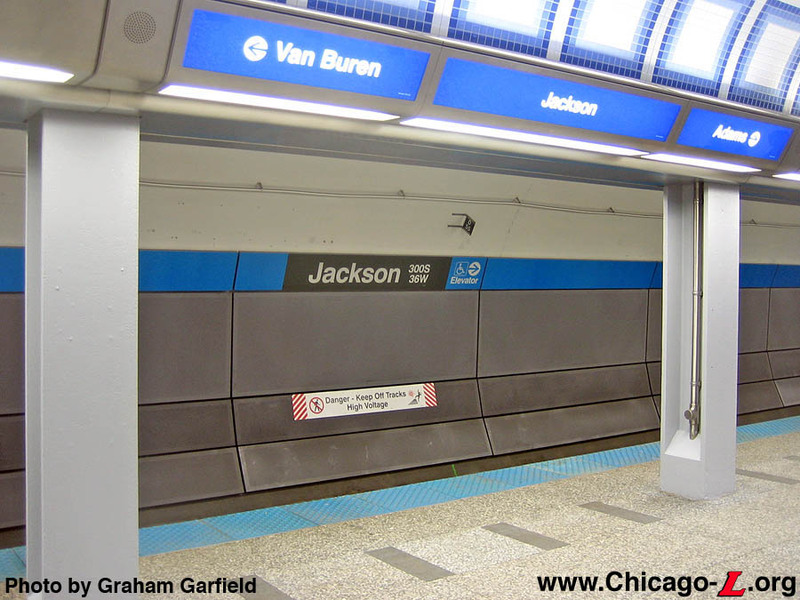 At 5am, Monday, April 30, 2007, the Jackson-Van Buren mezzanine reopened for entering traffic and the full length of the platform was available for use. Additional punchlist work continued during the following weeks. The cost of the renovation project was estimated at $9 million. Besides renovating the entire south mezzanine and platform, the CTA is also assuring that other aspects of the station are kept in working order. 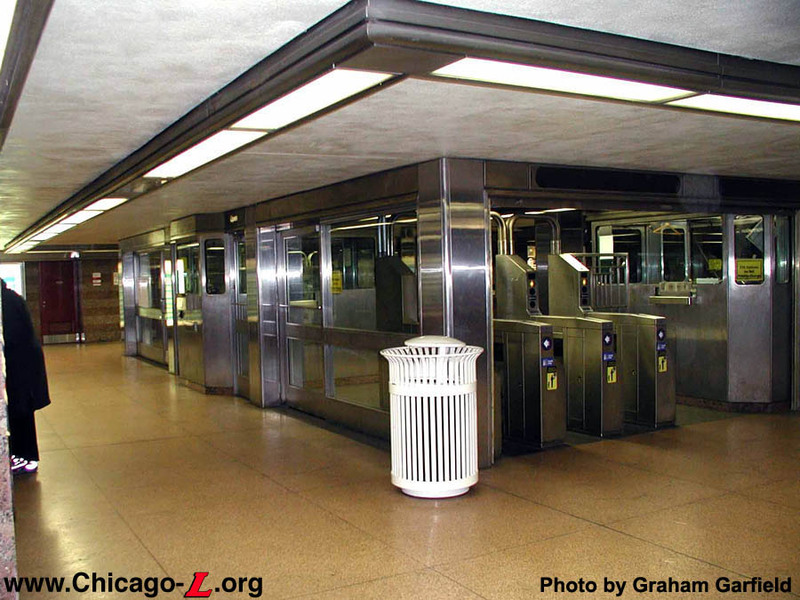 Continuing to upgrade and replace some of the oldest escalators in the CTA system, the Chicago Transit Board approved a $642,569 design contract for the replacement of 10 Loop subway escalators on June 4, 2003. The design work is the precursor to replacing the units with new escalators. The escalators pegged for replacement include seven on the Red Line and three on the Blue Line, including one at Jackson-Van Buren. Chicago-based Globetrotters Engineering Corporation was selected to provide architectural and engineering services for the project following a competitive bidding process. Rehabilitation involves completely stripping an escalator of all parts and replacing it with new or reconditioned parts, keeping only the original outer shell. Decisions on which escalators receive rehab or replacement are based on the age of the escalator, the condition of the escalator and the volume of customers passing through the station. The Regional Transportation Authority and the Federal Transit Administration are providing capital funding for the contract. Construction took place between September 2004 and May 2006.